However, while older people are quite well protected against poverty, there are clear differences between men and women across much of the EU. The figure below illustrates these gender differences for different age groups. A value above zero in the figure indicates a higher share of women threatened by poverty or social exclusion as compared to men in the same age group. Note: Sorted by the gender difference in the AROPE rate for the population above age 75. For the population below age 65, i.e. the working-age population and their children, gender differences in poverty are rather small. In contrast, when looking at women above age 65, a substantially higher risk of poverty or social exclusion than for their male counterparts becomes apparent. 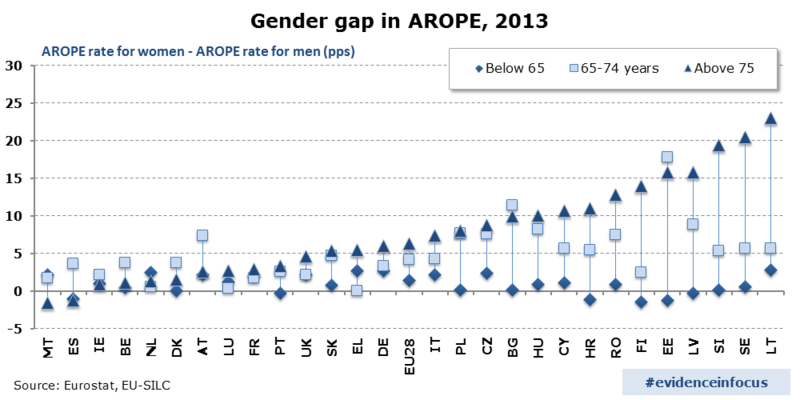 For the EU as a whole, this gender gap amounts to more than four percentage points for people between age 65 and 74, and increases to over six percentage points for those above age 75. What explains the higher poverty risk of elderly women? In all Member States, the average pension income of a woman is currently lower, and often substantially so, than that of a man. For the EU as a whole, the average pension of women stood at 60 percent of the average pension of men in 2012. Importantly, these calculations do include survivors’ benefits, which protect women to certain degree against poverty following the loss of their partner. The often substantial gender gaps in pensions reflect the gender gaps in remuneration, working hours and duration of working lives that women faced during their working lives. Pay differences may be rooted in education and skills levels, as well as various forms of gender segregation and discrimination. Household and caring duties relating to children and frail older relatives fall mostly upon women who experience more career interruptions and part time work than men as a result. Finally, the statutory retirement age for women is still lower than that of men in some pension systems, which leads to shorter contributory periods and can result in lower benefits. Further, the fact that older women often live alone tend to exacerbate their precarious economic situation as they cannot share costs which are not fully proportionate to household size (e.g., housing, insurance, electricity). 40 percent of women above age 65 live in a single household in the EU compared to only 19 percent of elderly men. What can be done to reduce the high poverty risk for older women? First and foremost, the key to an adequate pension in old age lies in longer and less interrupted working lives. Thanks to rising employment rates, many more of today’s working-age women will have built significant pension entitlements of their own when they retire. Nevertheless, women continue to have low-paid jobs, to work part-time and to interrupt their careers for reasons of care duties. Thus gender differences in old age poverty will not disappear in the foreseeable future; this would require much more determined efforts to achieve equal opportunities for women and men with regard to employment and professional careers. Preventing significantly higher risks of poverty for older women compared to older men therefore also requires specific measures within pension systems, such as credits for caring periods, minimum pensions, and survivors’ benefits. The European Commission has set a European agenda for making pensions adequate and sustainable in the long run in the 2012 White Paper on Pensions. To read much more about current and future income adequacy in old age in the EU, see the recently published 2015 Pension Adequacy Report. Author: M. Vothknecht works as a policy officer in the unit dealing with Social Protection Systems at DG EMPL. The views expressed in this article are those of the author and do not necessarily reflect the official opinion of the European Union.